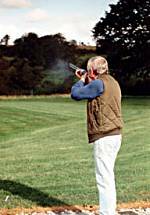 Clay Pigeon shooting, so called because the disc shaped targets replaced live pigeons in 1921, is an internationally recognised sport which has Olympic status. The weapons used are sporting shotguns of which we have a selection to suit all ages and sizes whether male or female. The clay pigeons (targets), which are basically made from pitch and limestone dust, are thrown through the air at varying speeds and angles to represent the flight of birds; few things can compare with the excitement and satisfaction of hitting and demolishing your first and every target. Why do they say pull when calling for a target? Because originally, a pigeon was released from a trap (box) by "pull"ing a string on the trapdoor.